Athlete's foot is a skin disorder officially known as tinea pedis. It is caused by a group of fungi called dermatophytes and is pretty contagious, often being caught on the floors of changing rooms and swimming pools. It thrives in warm, dark and damp environments such as sweaty trainers which are heaven for this fungi! Athlete's foot is more common in young men than in women, possibly due to the fact that they are more likely to wear runners/trainers. A typical scenario being a teenager running around, playing football, getting sweaty feet that then remaining in the sweaty and damp shoes all day. It could also be said that boys play more team sports and so tend to pick up the condition in the changing rooms or through shared towels. The symptoms of this fairly minor but annoying problem are a flaky, itchy rash on your foot, mainly between the toes and sometimes accompanied by an unpleasant odour. Sometimes the fungal infection can also spread to the nails causing pretty unsightly yellowing and drying of the nails. Salt soaks have long been used as a remedy for tired and sore feet. The salt helps to reduce the swelling associated with physical exercise as well as combating fungal and other microbial invaders that tend to make our feet their home. 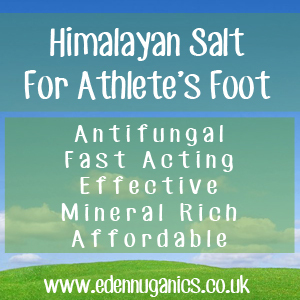 When using Himalayan salt in the treatment of athlete's foot, vinegar is often combined with the salt water solution. Without a doubt the best vinegar to use is raw, unfiltered apple cider vinegar. Apple cider vinegar is an extremely versatile and powerful liquid that has a rich history of medicinal use dating back to the times of ancient Greece. One of the key benefits of this rich amber liquid is its plethora of natural acids that offer antiviral, antibacterial and antifungal properties. The first step is to dissolve around 200 grams of Himalayan salt in 2 litres of water, salt can be crushed first to make this process quicker. Once most of the crystals are dissolved in the water, it is time to decant the solution into a pan to warm the mixture. This is purely for comfort; if you are in a hot climate you may wish to soak your feet in cold water. Either will suffice. Just be sure not to bring it to the boil as this will damage the minerals found in the salt. Next, add around 1 cup or 250 ml of apple cider vinegar to the salt solution and pour into a basin. Soak feet for around 10 minutes before removing and drying thoroughly. Use a hair dryer if necessary to ensure all moisture is removed (especially between the toes) before, then putting on clean cotton socks, or better still, open shoes where the feet can breath. 100% cotton socks are a very important part of the treatment as they allow the feet to breath. Also shoes that are made of leather or some other natural fibre where the feet can breath is essential. This process can be repeated morning and night until symptoms improve. Oregano Tea - Using around 4 ounces of fresh oregano leaves, make a simple tea by heating in a pan of water until infused. Once cooled to an agreeable temperature, add the mixture to a large bowl and soak affected foot/feet for 5 minutes, 2-3 times a day. Ginger - Like oregano, ginger also has a powerful antifungal action that helps to tackle even the most severe cases of athlete's foot. Finely grate some ginger and add to a pan of hot water. Once the solution has cooled down a bit, it can then be used as a soak in a similar manner to the oregano. Baking soda - Baking soda helps to kill fungi with its anti-fungal properties and it also helps to reduce the acidity of the skin, balancing the skins pH levels. Bacteria and fungi thrive in more acidic environments so creating a slightly more alkaline environment is always helpful.